Shell was the biggest of 12 corporate players (lime green in the Chukchi, grey in the Beaufort), and took the lead on offshore exploration and test well drilling. But in the face of unrelenting bad news, they began abandoning their plans. After fighting for a while to extend several leases set to expire in 2017, by the middle of this year Shell formally relinquished all but one Chukchi lease (set to expire in 2020) and abandoned their legal challenges to extend those expiring sooner. Meanwhile, all the other Chukchi lease holders shown on the map above, including Statoil, Eni, and Repsol, have also relinquished their leases, leaving the single Shell tract as the only active lease in the basin. Interestingly, the one they’re holding on to is the one where they drilled their test well; while the results there were reported as disappointing, they’re not giving up on its potential. Again, you can click to enlarge: check out the offshore pipelines, tanker routes, seismic survey areas that, by and large, never came to pass. 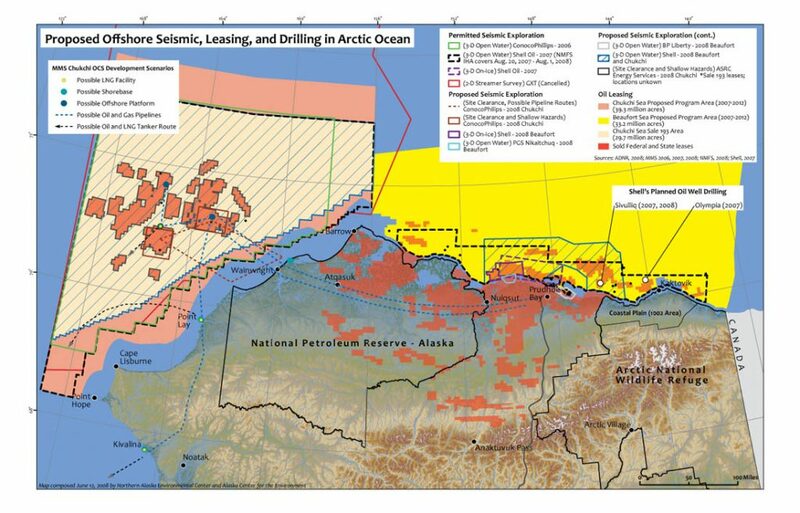 Now, with all but that one Shell lease abandoned, it’s relatively easy for the Obama team to shut down the tan Chukchi zone shown here, and to contract the yellow Beaufort zone to include just the near-shore areas where the industry is most interested in staying active. A close comparison of the withdrawal map and this one suggests that most of the orange areas in the Beaufort targeted for development in 2007 are still on the table; a few of the bits that are furthest offshore as well as those in the eastern end of the yellow zone are now in the exclusion zone. Though remember: even it what remains, the feds are not offering any new leases for the 2017-22 period. Industry interest in offshore development has not completely evaporated, but it’s getting pretty meager. In December, the Alaska Division of Oil and Gas was “surprised” at the number of bids they received in a new leasing round, and touted the numbers to emphasize the shortsightedness of Obama’s action. 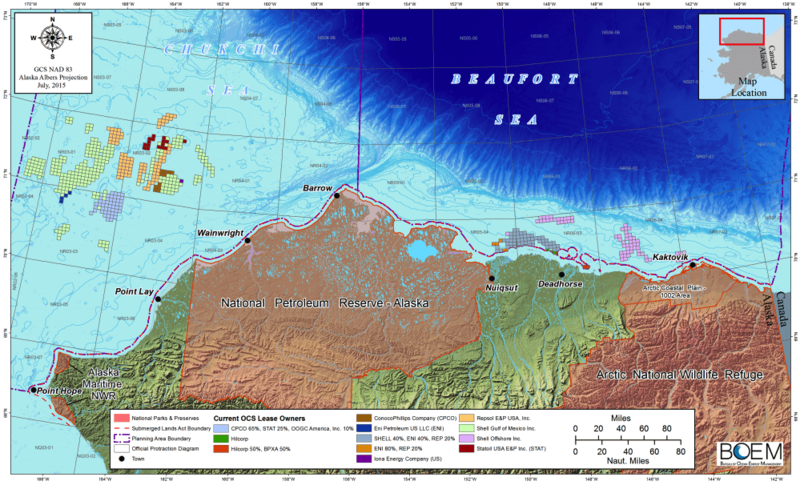 The vast majority of the sites were on the North Slope, but seven offshore leases were snapped up in state waters adjacent to the federal Beaufort leasing zone (they’re pink and orange on this map); six of these attracted a lone bidder, new to Alaska—which either indicates that there’s continued fresh enthusiasm or suggests that these sites are likely to join the long list of leased offshore areas that never make it into development. All in all, the Arctic moves look like a signature Obama approach, very much in keeping with previous actions on Alaskan oil and gas: he keeps the door open, avoiding permanent prohibitions, all the while knowing that the global oil market and emerging social pressures will impose far more effective and permanent limits on the potential for actual offshore development than heavy-handed government decisions. That’s excellent! We’re going to protect a long string of biologically productive canyons along the continental shelf. Hip hip. 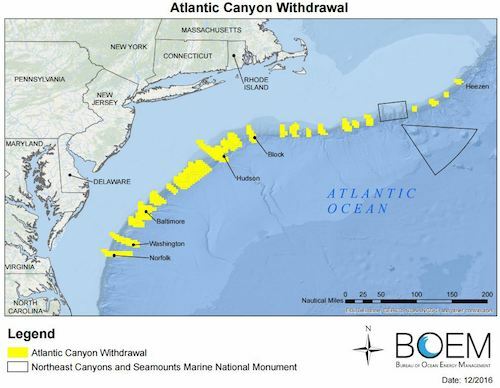 But only the two southernmost of these canyons are actually part of BOEM’s long-term offshore oil and gas development zones anyway; see the map at the right for a look at the two large planning areas that were pulled out of the leasing process for 2017-22. 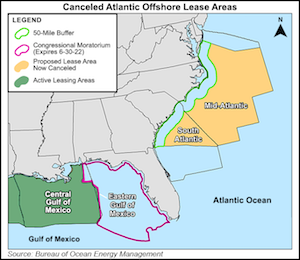 At this point, there is no plan to re-open the North Atlantic Planning Area to offshore exploration and development; of course, this could quickly change with the incoming administration, so again, Obama’s action may keep that idea from gaining a foothold in the next four years. The withdrawal action is nearly certain to be challenged in court, but by the time it works its way through the legal process, even if it’s overturned there wouldn’t be time to do more than initiate the multi-year Programmatic EIS process that would be the first step of re-opening northeastern waters to development. So, the bottom line: this big new withdrawal action doesn’t actually take any areas that are currently in the leasing pipeline out of action. 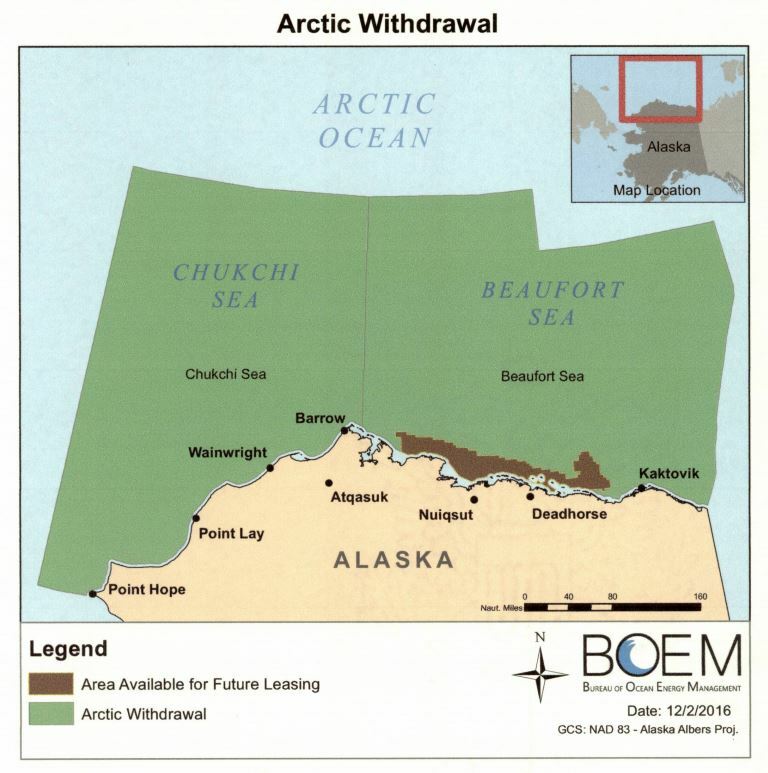 It does slightly reduce the size of the zone off Alaska’s northern coast that is routinely part of the BOEM’s 5-year leasing cycle, and it may slow down attempts by the Trump crew to kickstart fresh offshore development before 2022. If it survives its legal gauntlet (culminating in a regulation-averse Supreme Court), then the withdrawal will spare the high-risk far offshore Arctic waters from inclusion in future 5-year planning cycles (though only for an “indefinite” period); meanwhile, the two primary Atlantic planning areas are still fair game for the next round. With no active production planned in any of the withdrawn areas, even without these actions we were many years, likely a decade or two, away from any new Arctic offshore or Atlantic canyons oil flowing into refineries. Turning off any fossil fuel spigot is a good thing—at least if it stays off—but we have to acknowledge that these actions did not affect any current or planned spigots, and so have not reduced our climate footprint by one iota, either immediately or over foreseeable future. Sad to say, but true. So now you know “the rest of the story,” to steal Paul Harvey’s tagline. I’m not exactly sure why it felt like a story needing telling; most likely I’m just hyper-sensitive to headlines and press releases that oversimplify issues I care about. I definitely can’t begrudge my fellow earth warriors the chance to feel like something went our way at last. And I am certainly grateful for each and every day that these waters will be spared the noise intrusions of 21st century offshore oil and gas development. This is a rare bit of good news. Sorry to be the one pointing out the “bit” of it….